A friend of mine, no doubt thinking I needed a little more levity in my life, gave me a hula girl doll – the little plastic figurine that, well, bobbles and wiggles on top of the dashboards of respectable automobiles. He was disappointed when the hula girl arrived with a broken hip. Not to worry, because this same friend, with the assistance of a little glue, repaired the hula girl and presented it to me as a stand-by until the replacement arrived. I am now the proud owner of two hula girls, one with a broken hip and one who can wiggle her hip just fine. One can never have too many hula girls. I guess I’m not supposed to have favorites, but I kind of like the girl with the broken hip. There is something about that “flawed but sassy” look I like. 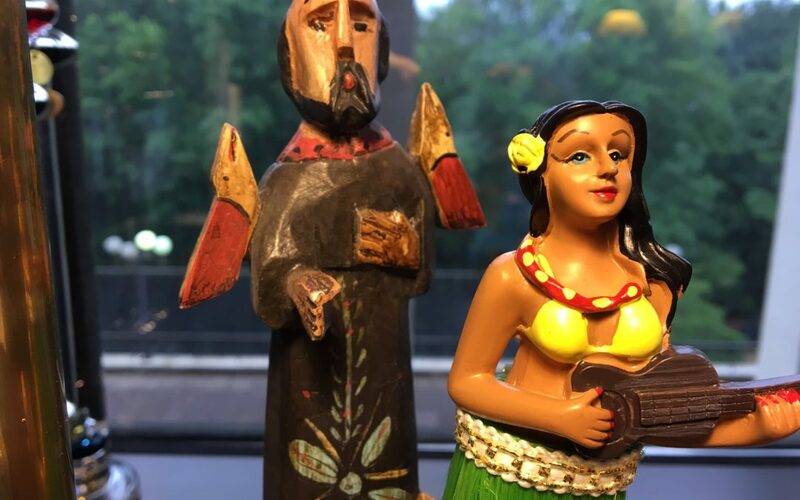 I keep her perched right beside a small figurine of St. Francis, which seems to me a safe place for a hula girl to hang out, broken hip or not. As my beach vacation approaches, I look over at my hula girl and smile. I have friends that will join me on the sandy gulf shores and together we will assemble our children, our stories, and our laughter. For a few brief days we will listen to surf and to music and dance like, well, like a hula girl with a broken hip. More than anything else we will remind each other of the grace of friendship. We have our flaws – some are pieced back together in a crude repair, and other flaws are out there for the world to see. When we were younger we may have worked a little too hard at vacationing: organized meals; stacks of books that we “had to get through;” designation of responsibilities of chores and expectations. Now we are just glad to be together. Somehow the meals get cooked and dishes get cleaned and there is always a good beat to listen to. It is a privilege to have the resources each year to take a beach vacation. I know for some people such a getaway is a luxury of time and money only to be enjoyed once or twice in a lifetime. I am grateful. More than the privilege of a vacation, however, is the gift of friendship. No, maybe gift is not the right word. It is the grace of friendship. Grateful to count on both my hands the ones I love. You don’t have to go to the beach to make a friend. Keeping a friend will cost you no money. Loving your friends is God’s grace to you and glimpse of eternal things. This time next week I will be dancing with my friends like no one is watching…except for St. Francis, but I think I detect a slight smile.